Open champion Henrik Stenson has won the Golf Writers' Trophy for a second time. The award is voted by members of Association of Golf Writers' and recognises the person or persons, born or resident in Europe, to have made the year's most outstanding contribution to golf. TG's biggest ever equipment trial will help you make a smarter buying decision! Having claimed his first major at the Open at Royal Troon by winning a thrilling duel with Phil Mickelson, Stenson won this award with an overwhelming majority in the voting. This was despite stiff competition from the Masters winner Danny Willett, Olympic champion Justin Rose and Alex Noren, who collected four European Tour titles in 2016. In a stellar year, the 40 year old from Gothenburg also won the BMW International Open at Golf Club Gut Laerchenhof, Pulheim in Germany three weeks before his Open triumph. 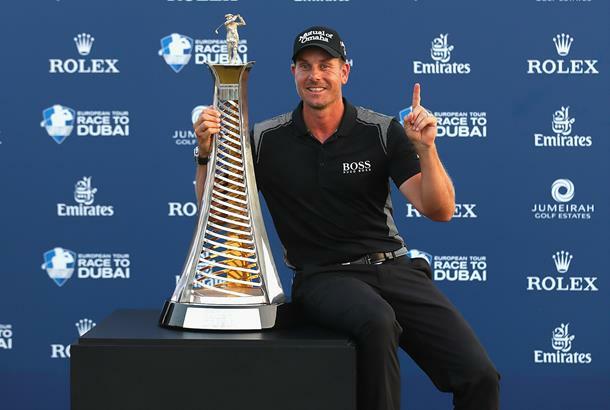 Stenson claimed eleven other top ten finishes in 2016 and secured the European Tour's Race to Dubai for the second time. He was also the silver medalist behind Rose at the Rio Olympics. "It is always a great honour to receive the Association's award," said Stenson. "We talk about receiving recognition from your colleagues and your peers but in this instance it's great to be receiving that recognition from some of the most knowledgeable media in the sport. "So it's wonderful to be chosen as their Golfer Writers Association Trophy winner and I feel very honoured to win the award for a second time in my career," added Stenson, who first won this award in 2013. "It's been a fantastic season for me winning my first Major at Royal Troon, winning the BMW International in Germany, winning a Silver medal at the Rio Games and finishing first again in the Race to Dubai. "The manner I went about this year was very pleasing from start to finish. I know that the award is presented just before the 2017 Open, so it's going to be very nice being present at Royal Birkdale next July to relive all those great memories of what I achieved at Troon. "It's been a great year for European golf and the European Tour and even though we didn't bring back the Ryder Cup, I look back knowing that winning the Open helped so much in winning the Race to Dubai. "And while Danny has to be congratulated for winning the Masters, I again have to thank the Association of Golf Writers in voting me as their Golfer of the Year. "I'll never grow tied of being weighed down with trophies!" AGW President Goran Zachrisson, commentated on Stenson's Open triumph for Swedish television. He said: "For Hernik to win the AGW Golfer of the Year award for a second time in four years speaks volumes, not only of Henrik's achievements on course in 2016, but for the very strong relationship he enjoys off course among those who report golf full time." AGW Chairman, BBC Golf Correspondent Iain Carter, said: "Not only is Henrik an outstanding golfer, but he is one of the game's finest ambassadors. I think it is fair to say a great many of the the golf writers were thrilled that he secured his long awaited first major title and this was reflected in their voting. "He won the Claret Jug in fantastic style by beating Phil Mickelson in an epic duel that left the rest of the field as nothing more than bit part players. It was a contest that will long be remembered as one of the greatest Open performances ever witnessed."